An Unpronounceable Volcano as Black Swan? Taken 10 km east of Hvolsvollur Iceland on April 18th, 2010. 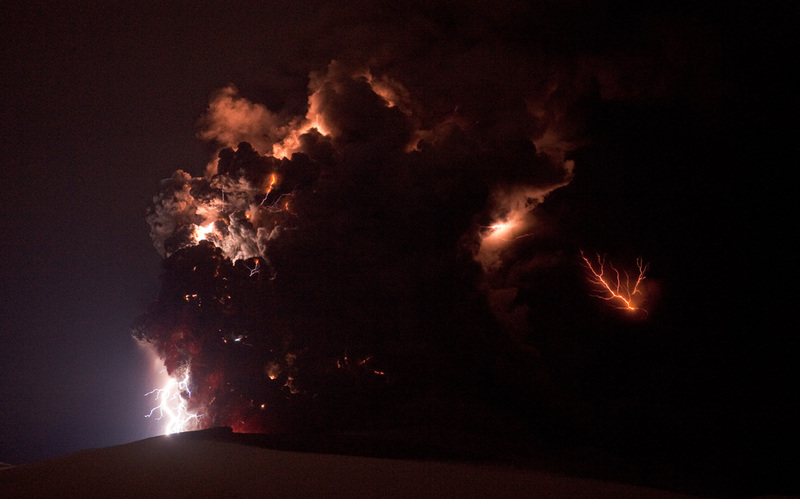 Lightning flashes and glowing lava illuminate parts of Eyjafjallajokull's massive ash plume in this 30-second exposure. Scale-free networks are everywhere. 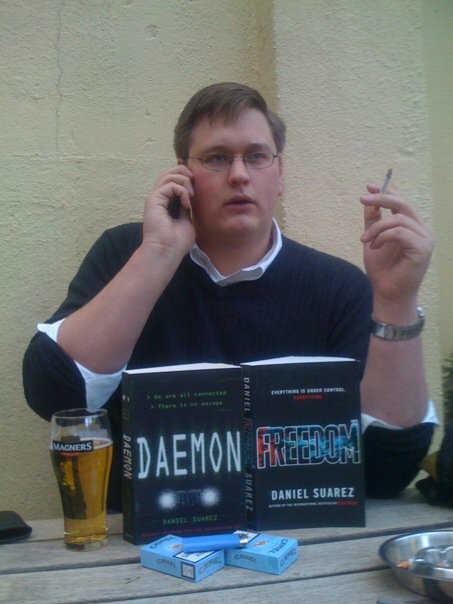 The can be seen in airline traffic routes, connections between actors in Hollywood, weblog links, sexual relationships, and terrorist networks. So what exactly is a scale-free network? A scale-free network is one that obeys a power law distribution in the number of connections between nodes on the network [emphasis mine]. Scale-free networks are extremely tolerant of random failures. In a random network, a small number of random failures can collapse the network. A scale-free network can absorb random failures up to 80% of its nodes before it collapses. The reason for this is the inhomogeneity of the nodes on the network — failures are much more likely to occur on relatively small nodes. Scale-free networks are extremely vulnerable to intentional attacks on their hubs. Attacks that simultaneously eliminate as few as 5-15% of a scale-free network’s hubs can collapse the network. Simultaneity of an attack on hubs is important. Scale-free networks can heal themselves rapidly if an insufficient number of hubs necessary for a systemic collapse are removed. Examining the fallout from Eyjafjallajokullin in this light does present an interesting dichotomy. If we consider the entire globe as one big air traffic system, then it definitely is showing resilient capabilities. Flights are diverted around the affected nodes and redistributed to areas unaffected by the ash cloud. It’s as if Europe was a tumor that has been surgically removed from the rest of the airborne world. Thus, of course most everyone can continue to fly whether or not Europe’s airports are open. The global network is continuing to function. And in fact, it’s hard to conceptualize European airspace as an isolated network. At this point all air traffic to and from the continent is inextricably bound to the rest of world, and so it’s hard to imagine an inverse scenario in which the rest of the world ceases to fly while Europe muddles on. However, this picture changes slightly if we consider the voluntary closure of most European airspace as an intentional attack. Robb gives the threshold as 5-15% of a system’s capability. Of the 30 busiest airports in the world in 2009, seven are in Europe, those seven with total passenger traffic of 268 million people a year. If 1.5 billion people travel by plane every year, that’s roughly 18% of world capacity (and that’s before taking into account all the other European airports that didn’t crack the top 30). For the rest of the world, it’s a relatively stable – if infuriating – situation. I suppose the real determining factor is that while the initial closures were shocks to the system, they didn’t begin on a Europe-wide scale, and by the time those in the east started closing, it was no longer a surprise. Either way, the system is voluntarily taking at least a fifth of itself offline, which gives rise to an interesting third possibility that Robb doesn’t mention: how much of a system can turn itself off before collapse? Arquilla is correct: a netwar-enabled military would be powerful. Swarms of small American units could be perfectly suited for dismantling irregular terrorist networks in Afghanistan and elsewhere. However, America will never have a netwar military. Why? One reason: the political cost of casualties. While a network of small swarming units represents substantial capacity, it also increases the risks to individual units on the battlefield. Operating quasi-independently and at speed, netwar’s small units are vulnerable to being flanked, isolated, and overrun. The network is resilient, but individual nodes are exposed. Albon also cites the Battle of Wanat – with an American contingent of the same ‘small unit’ size advocated by Arquilla – as an example of how this particular conception of ‘netwar’ is in fact precisely wrong for waging war in a democracy. The attack left nine U.S. soldiers dead and the outpost was quickly abandoned. If the Taliban’s attack had been successful, the loss of this one node would have had little detrimental effect on an Arquillan network of small units. Still, the military already seems to be considering the idea, with exercises scheduled for this summer to determine the feasibility of a company-sized Marine landing team. Of course, then logistics become the primary problem (plus the lack of battalion C3I, etc), which in turn leads to more deaths, which of course is the whole point for the enemy. Leaving aside the issues of media control and information handling (because I still keep the faith), how then could a node-centric strategy utilizing smaller units actually function? Obviously, one key component to coming wars is UAVs and other unmanned weapons platforms. Most of these systems are currently more mobile than needed to be effective in a node-centric system. Automated sentry guns and the like, coupled with appropriate surveillance equipment and on-call air support – manned or unmanned – would be enough to maintain a network of observation posts without risk to American lives. Then again, perhaps it’s the concept of nodes as they currently stand that needs to be addressed. Obviously not all OPs could be replaced by drones and remote-controlled camera, but presumably some could be. The further goal of the OP; that is, contact and interaction with the native population, could just as easily be accomplished through means other than an isolated post. Albon might overstate the case for maintaining centers of gravity (“There is power in small, networked units, but there is security in massed forces and large fortress bases, both for servicemen and politicians”), but he certainly grasps the risks of not doing so. Presenting an American war effort to the public, then, is a two-part project. One is to convince them that both the overall and the specific causes are just (why are we in Afghanistan? And why do we maintain a network of isolated observation posts)? Two is to make sure that American casualties are in line with the perceived goal of it. Perhaps nothing more than a good PR strategy is what’s needed, but I think the issues with netwar run a bit deeper. Just ahead of Oscar night, word comes that Disney is pulling the ABC channel from Cablevision – affecting about 3 million subscribers in the New York-New Jersey area. ABC is, of course, scheduled to broadcast the Academy Awards tonight. I’m in no way affected by this, be it living in New York, a Cablevision subscriber, or a religious Oscar aficionado, but this is still pretty outrageous. If you subscribe to cable, you’re now denied access to a theoretically public access channel. ABC may no longer broadcast in analog, but it still does in digital – across frequencies in the public spectrum, which have been leased from the public (and which existing analog broadcasters were able to obtain licenses for without an auction). Of course, the former obligations that stations using public airwaves were held – such as the “fairness doctrine” – have been allowed to lapse. No one is required to do much of anything anymore, save not broadcasting ‘filth’ and ‘obscenities’. But worse is that millions of people are denied access to a station in the public spectrum over a billion-dollar dispute. I know, I know, theoretically everyone could go out and buy an over-the-air broadcast converter, but how many of those do you think are in stock in the New York metro area? Nobody at all wins here. Like many of the green movement activists, Sadeghi’s belief in the protests seems related to their “horizontal organization,” the fact that they were structured without hierarchies. This was supposed to be the great strength of the movement, but it is also an abiding weakness. A horizontal organization can’t clearly delineate different roles to different people according to their strengths; it can’t reward those who participate, or sanction those who hesitate. Facebook enabled many young Iranians to forget these points. Now obviously the Taliban is not organizing via Facebook, but the principle of decentralization is the same. Avoid having a center of gravity, put together your demonstrations (attacks) at the last possible minute; coordinate, execute, and then melt away into the night. But if the Iranian green movement using the same principles was successfully put down, does this offer us a rubric for approaching insurgencies? 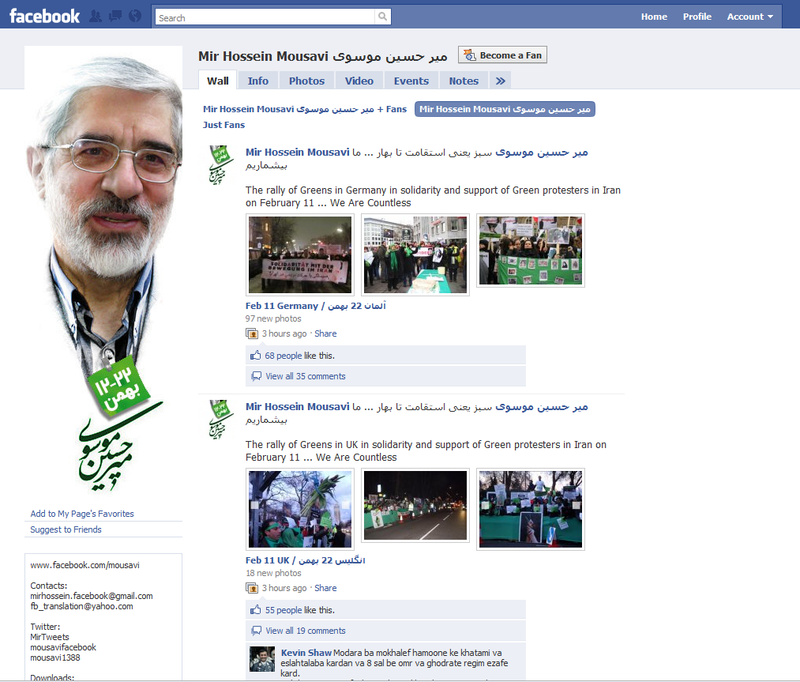 Mir Hossein Mousavi's Facebook page. The short answer is probably not. The Taliban is not planning its operations through Facebook or tweets. But the reason the Revolutionary Guard so effectively shut down the protests was by blocking access to means of communications; that is to say the internet. No Gmail, no Facebook, no twitter meant that there was no coordination between demonstrators, nor was there a way to quickly spread the word of crackdowns in a particular area. The networks used by the Taliban for communication are more dispersed, making a system-wide shutdown more difficult. Walkie-talkies and satellite phones are the order of the day, and while we can intercept calls, we cannot easily end them. Even if we did, human couriers would merely proliferate further. Also worth keeping in mind is the psychological element. The pushback given by the Iranian regime was demoralizing and a clear setback for the movement, slowing momentum and further progress. Presumably more than one green movement adherent changed his colors, or at least plans to lay low thanks to the IRG. But when ISAF and the United States attempt to stop the movement (the Taliban), it disperses them without costing the Taliban anything. Most of the Iranian protesters were relatively concentrated – do we need to herd Taliban fighters into a single killing zone? And is the Battle for Marjah a step in that direction?